Elsik's Insight Shines at Oklahoma City! 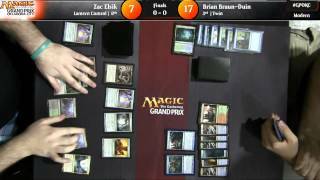 Zac Elsik's unusual Lantern Control deck took command through the Top 8 of Grand Prix Oklahoma City. Lantern of Insight has truly illuminated Modern thanks to the hard by Grand Prix Oklahoma City champion Zac Elsik. By defeating two-time Grand Prix winner Brian Braun-Duin in the finals after finishing undefeated on Day 1, Elsik turned his standout Top 16 performance from Grand Prix Charlotte into ensuring every Modern player will put a new deck into their testing and learning rotations. But there was much more to the weekend in Oklahoma City than a singular deck. The effect of Magic Origins on Modern continues to be felt with other decks picking up new tricks. Hangarback Walker has made a splash across every constructed format, and it’s home in Modern Affinity deck is now firm. For Elves, already recently bolstered by Dragons of Tarkir’s Collected Company picked up both Shaman of the Pack – which featured in Day 1 undefeated player Chris Lopez – as well as Dwynen’s Elite, the addition to Top 4 finisher Andrew Sullano’s green exclusive version. And for those keeping count, fourth-ranked Paul Rietzl came off his World Championship Top 4 into yet another Grand Prix Top 8 finish. Another weekend, another notch for a Pro Tour Hall of Fame member continuing to show their excellence. But from the 1,470 players the started and the 166 that earned the return for Day 2 there was just one new champion for both Oklahoma City and Modern: Congratulations again to Zac Elsik and his Lantern Control deck, the winners of Grand Prix Oklahoma City. 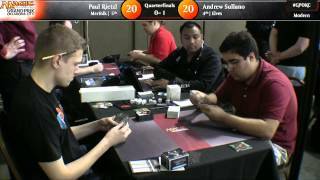 The march of Modern is on the move at Grand Prix Oklahoma City. From the 1,470 players that started Day 1 just 166 remain, and at the top of the heap are several undefeated players: Zac Elsik, Chris Lopez, Matthew Duggan, Tripp Brister and Daniel Duan. With archetypes like Lantern Control and Magic Origins enhanced Elves among the undefeated five it’s clear Modern has stepped firmly into new territory to explore. Behind the five on top are a pack of pros right on their heels, including Pro Tour Hall of Fame member and fourth-ranked Paul Rietzl, seventeenth-ranked Steve Rubin, eleventh-ranked Brad Nelson, Reid Duke, Pro Tour Hall of Fame member and Pro Tour Journey into Nyx winner Patrick Chapin and more. The time to crown another Grand Prix winner comes soon for the Sooner state. 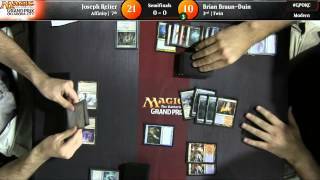 Continue following the action all weekend long with more live coverage of Grand Prix Oklahoma City featuring Marshall Sutcliffe, Randy Buehler, and Jacob Van Lunen at Twitch.tv/magic2! The march of Modern is on the move at Grand Prix Oklahoma City. From the 1,470 players that started Day 1 just 166 remain, and at the top of the heap are several undefeated players: Zac Elsik, Chris Lopez, Matthew Duggan, Tripp Brister and Daniel Duan. With archetypes like Lantern Control among the undefeated five it’s clear Modern has stepped firmly into new territory to explore. The time to crown another Grand Prix winner comes soon for the Sooner state, and we’ll continue following the action all weekend long. Join us Sunday starting at 10 AM EDT (7 AM PDT; 3 PM CET) for more live coverage of Grand Prix Oklahoma City with Marshall Sutcliffe, Randy Buehler, and Jacob Van Lunen at Twitch.tv/magic2! The hashtag for Grand Prix Oklahoma City is #gpokc. Join the conversation!